Added the ability to rearrange product option values. If you click to Edit product Options, a panel opens up on the side, as pictured below, and you can drag and drop them into whatever order you like. This comes in handy when these values aren't listed in the correct order on the website, and need to be adjusted. Made it so the Work Order ID is clickable from the SN History page. This allows merchants to see exactly what happened without having to go over to the work orders module. 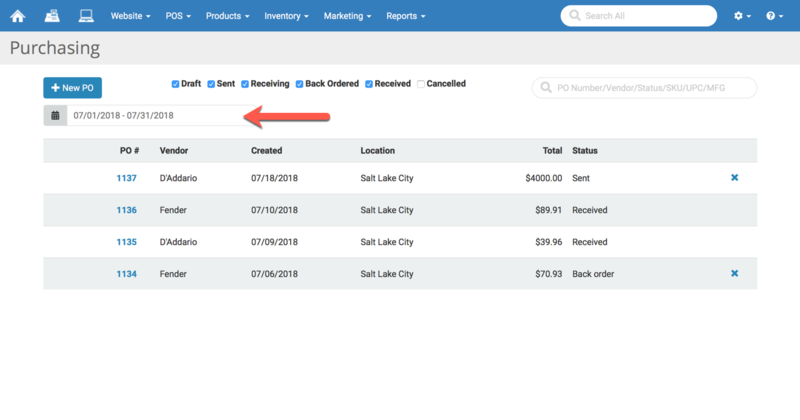 You may now filter Purchase Orders on the Purchasing summary page and Receiving Orders on the Receiving summary page by the date the order was created. Clicking in the field with the Calendar icon opens From and To calendars and you can then choose your date range. 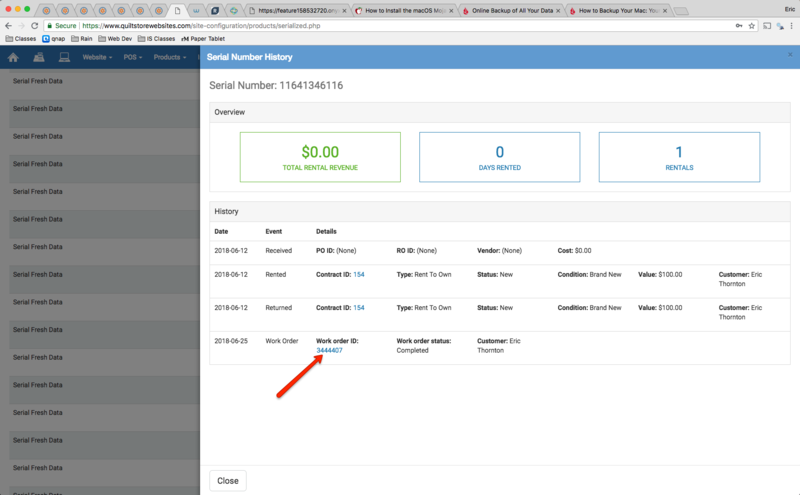 Fixed an issue where the total amount for a web order to capture was rounding up one penny more than what was authorized, which disallowed the merchant from being able to capture the funds. 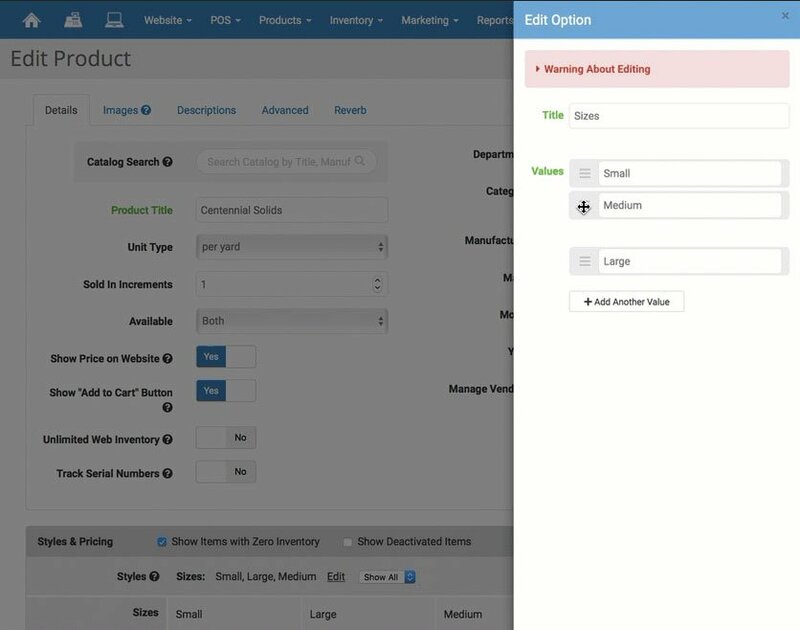 Fixed an issue where clicking the Load More button while browsing existing vendor products on a Purchase Order or Receiving Order would not actually load more products. Fixed an issue where the inventory displaying in certain parts of the system didn't match what was actually in stock. There wasn't a problem with inventory, it was simply a display issue. Fixed an issue where the Cost for some products wasn't displaying or being factored into the margins within the Transaction Details report and Sales by Item report.